It's inconceivable that I have just put my kids to bed by candlelight for the third night in a row (OK, their Dad uses a flashlight) because our Ohio home is in its 59th hour without electricity--DUE TO A HURRICANE. Update: We ended up going a FULL WEEK without power, about 175 hours! Apparently, we now have all the problems of coastal living: wind gusts, power outages, downed trees, without actually getting to live near the ocean. There was even a surge today when 3,000 food stamp users stormed downtown Dayton for applications to help make up for their fridges of spoiled food. I never thought I would say this, but THANK GOD our family milks cows 50 feet from my back door. We have been able to tap into the tractor-powered generator that the farm owns to ensure that the milking equipment will run. And there's nothing so soothing as falling asleep to the gentle flicker of candlelight and the sound of a tractor-powered generator outside the bedroom window. Anyone who has ever lived in an old house can tell you, though, that there is never an easy way to "tap" into anything when you are dealing with electrical and plumbing systems developed shortly after such things were invented. So we have ONE ROOM with full electric and cords stretched through our house that were previously used to power heat lamps in the sow pen. We had an epiphany today when we realized that by moving the microwave to the other end of the counter, we could have HOT FOOD. Other breakthroughs include moving the toaster to the living room and buying paper plates so we don't have to wash dishes by hand with cold water (no, the water heater and dishwasher didn't make the electrical cut). While camping out in our own home is a pain, things could have been a lot worse. 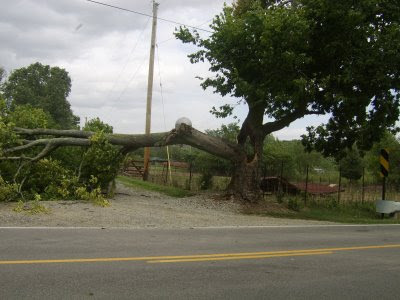 We were lucky that the tree that fell at the end of our lane didn't hurt anything, especially after our kids' favorite neighbor "Horn" hauled it out of the way. 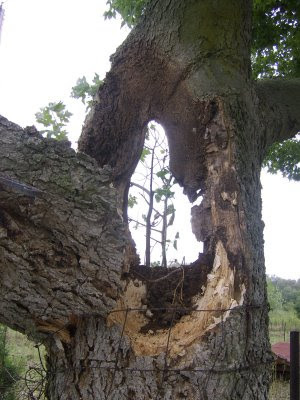 The tree was so rotten that two halves fell away, leaving a gaping hole in the middle. 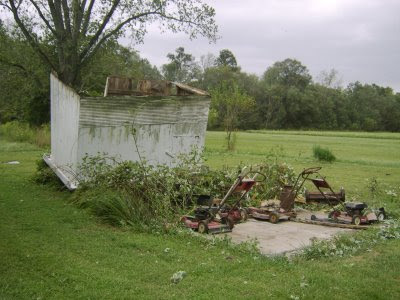 My husband's saintly Grandmother also lost part of a big tree and had her little shed upended. Fortunately, her stash of ancient pushmowers was undisturbed. So far this year, we have survived a blizzard and now a hurricane. This may be the very best time to take up real estate. Apparently, we can offer both skiing and coastal living right here in Ohio.